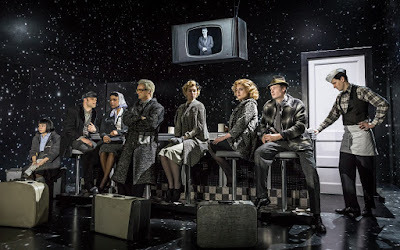 Last Friday night Stuart and I went to see The Twilight Zone at the Almeida Theatre in London's glitzy Islington. Adapted by Anne Washburn (yes, she of the dreadful Mr Burns) and directed by Olivier Award-winner Richard Jones, this world premiere production of the acclaimed CBS Television Series The Twilight Zone lands on stage for the first time in its history. Or its present. Or its future. Who can say? Most pf us can all do The Twilight Zone theme music (Do-do Do-do, Do-do Do-do, if that helps the uninitiated) and most of us know that this was the TV show in which the downright spooky bumped into sci-fi. Factoid: That title music was written by Bernard Herrmann - the man best known for the stabbing violins in Hitchcock's Psycho. The cast pitch-perfectly replicates the camp earnestness of the original series. This is the closest theatre gets to black and white TV. A starry night sky serves as a backdrop and goggle-wearing stagehands twirl cut-outs for special effects. What elevates Richard Jones’s funny and frightening production is the way in which Washburn uses nostalgic horror to comment on modern America. The final story about a suburban community under nuclear attack climaxes in a race war. It’s as if there are forces in the universe telling us something about Trump’s America. You might say, the truth is out there. Oh, sorry, that’s The X-Files.